The CN63300 series has been discontinued. Please see the Platinum Series as a possible alternative or contact our sales department. The CN63300 Series accepts either a 0 to 10 Vdc or a 0/4 to 20 mAdc signal,precisely displays the input process signal according to the programmable scaling points, and provides an accurate output control signal (time proportional or linear DC) to maintain the process at the desired control point. The controller’s comprehensive yet simple programming allows it to meet a wide variety of application requirements. In the PID control mode, the controller operates with on-demand auto-tune, which will establish the tuning constants. The PID tuning constants may be finetuned by the operator at any time and then locked out from further modification. The controller employs a unique overshoot suppression feature, which allows the quickest response without excessive overshoot. The unit can be transferred to operate in the manual mode, providing the operator with direct control of the output. The controller may also operate in the "ON/OFF" control mode with adjustable hysteresis. A second setpoint is available to allow quick selection of a different setpoint setting. Dual 4-digit displays allow viewing of the process temperature and setpoint simultaneously. Front panel indicators inform the operator of the controller and output status. On many models the main control output and the alarm outputs are field-replaceable. Optional alarm(s) can be configured to activate according to a variety of actions (absolute high or low, deviation high or low, band in or out, with adjustable hysteresis. A standby feature suppresses the alarm during power-up until the temperature stabilizes outside the alarm region. The second alarm can be configured as a secondary PID output (heat/cool applications). The optional main linear DC output (10 V or 20 mA) can be used for control or temperature re-transmission purposes. 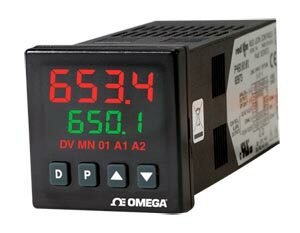 Programmable output update timer reduces valve or actuator activity. The output range can be scaled independent of the input range. The optional remote setpoint input (0/4 to 20 mA) allows for cascade control loops and remotely driven setpoint signals from computers or similar equipment. Straightforward end-point scaling with independent filtering and local/remote transfer option expand the controller’s flexibility. For “-C4” RS485 option, software is a free download from omega.com.